As 2017 comes to a close, Orbital ATK teams continue to work on key company programs including our Cygnus cargo resupply spacecraft, Advanced Anti-Radiation Guided Missile Extended Range (AARGM-ER), and our Next Generation Launch System, pushing the boundaries of the future of space exploration and our nation’s defense systems. 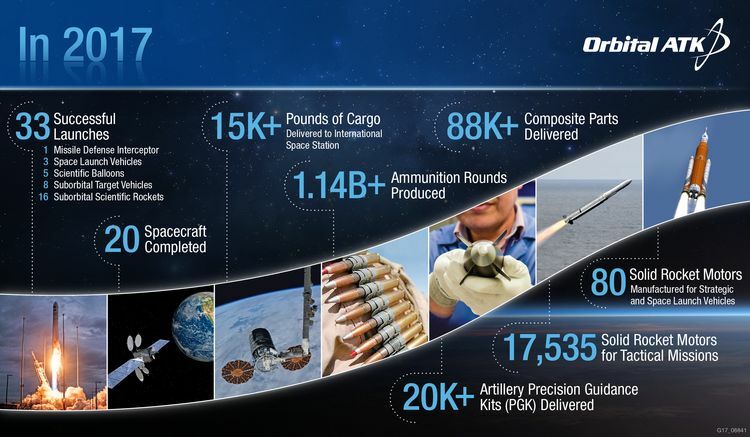 Throughout the year, Orbital ATK has hit key milestones in several of its programs and accomplished several “firsts” for the company. As a global leader in aerospace and defense technologies, we are is committed to delivering dependable and affordable aerospace and defense technologies to our customers and being "The Partner You Can Count On."